I found it quite easy to get drawn into this movie. It was nice to have the opportunity to see the characters interacting with each other throughout the film. Although there were times I was getting confused between the characters (especially when they were on the mountain and wearing coverings on their face), I did like the fact that quite a few of them had lives outside the mountain that were shown. I especially liked that with Beck… though it was also nice to see Rob’s relationship with his wife; even if I wasn’t sure what his relationship with many of the others was. It was nice to see some of the semi-rivalry between Rob and Scott. I liked seeing them working together in the teams later on… and I thought it was good to be able to see the way they built up to climbing right up to the summit. I thought there was a lot of tension in the movie. I found myself sitting on the edge of my seat at various points, drawn into the movie. 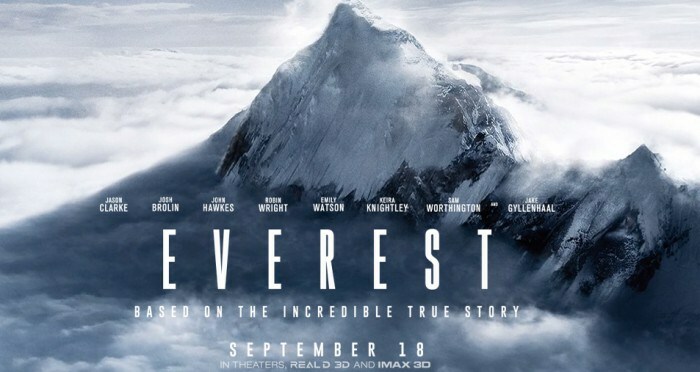 It didn’t make me want to climb Everest… in fact, it put me right off any kind of mountain climbing activity. I recognised a lot of the actors in this movie and it was good to see the way they played off each other. I especially liked the conversations between the characters and their spouses. I really cared about the characters’ safety in this movie. The film was entertaining, but quite difficult in parts to watch. I liked seeing how determined Beck’s wife was and I thought that the timings and dates added a lot to the tension of the movie. It was good to see what the base camps and other camps were like and it was interesting to see the amount of preparation and equipment they needed to take with them. This film succeeded in drawing me in and making me care about the characters and the plot. By the end, I felt a bit like I’d been put through an emotional wringer – there were a lot of different strong emotions portrayed and felt in this movie.